We headed into California on August 6th, leaving Winnemucca and heading for the state border along I-80. We crossed into California north of Lake Tahoe, entering the cute and very busy (with tourists) town of Truckee. We paused there briefly to run into the visitor center for a map (Angie came back with three so we could see which might be the most useful) before beginning the final leg of the day. We drove through several passes, including the famous Donner Pass, climbing up to about 7,000 feet before making a very rapid descent to the Central Valley. We went down about 6,000 feet in hardly any time at all, riding some fast-moving and winding roads before reaching our evening’s destination of Stockton. We stopped in Stockton mainly because it was in the general direction that we were headed, and also had a hotel where we could use the last of our reward points for Choice Hotels, the chain in which we’ve been staying most of the way while in the U.S.
We had decided against camping because the California Central Valley is usually ridiculously hot in the summer, but it turned out to be quite mild. I had thought about taking advantage of the pool, but it really wasn’t terribly warm that day, so it was less attractive. And of course, since we had Rebbe with us, we couldn’t go to the pool at the same time anyway. Dogs are generally not allowed in public areas of hotels and we couldn’t leave him in the room. I can’t remember much that was remarkable about our evening there, though I think we at least got out for a walk with Rebbe and passed a complex that seemed to be home to a medical collections agency, and not much else. Lots of empty storefronts. The next morning we continued on our way, via I-5 and then cutting across to U.S. 101 on the Pacheco Pass, which was also quite a descent (California route 152). We paused at a roadside farm store in Bell Station to buy some provisions for the evening. Their vegetable and fruit prices were pretty good and we got a bunch of stuff for just a few dollars. 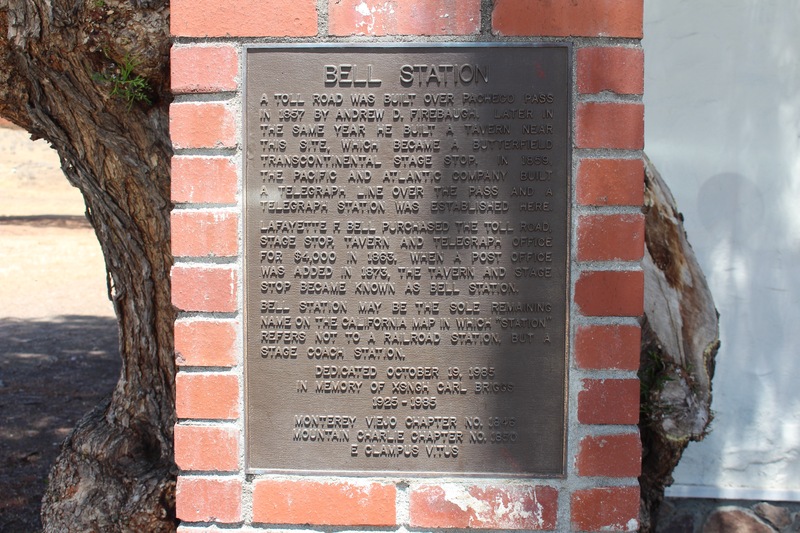 There was a historical marker right there telling us something about the place, and I later read that Bell Station is the only remaining place name in California that refers to a stage coach rather than railroad station. I’m not 100% convinced of this, since I know we passed at least one other place with station in it’s name recently that wasn’t an Amtrak stop. We were headed this day (Friday) to the little town of Santa Margarita, which is in the area often known as the Central Coast. It’s not really that central, but it’s between Los Angeles and San Francisco, which are the two largest cities in the state, and it’s an area in which I used to live and which I love a lot. 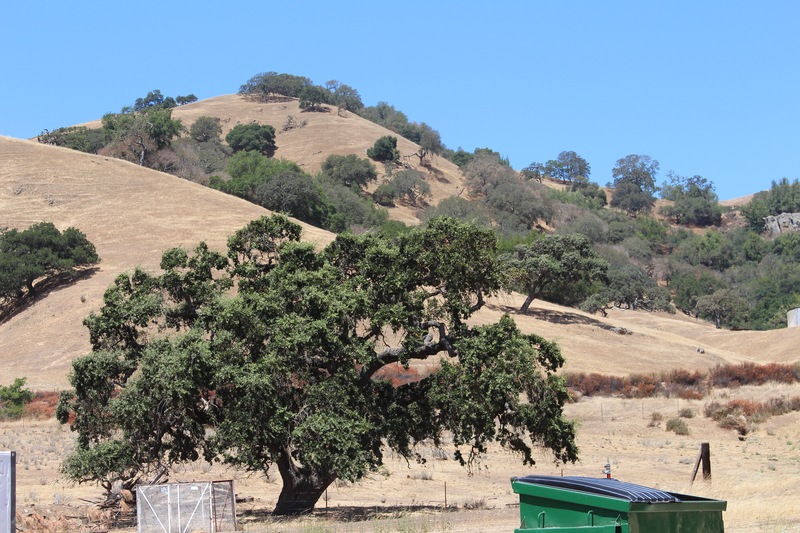 Our route took us down highway 101 through Paso Robles and Atascadero. 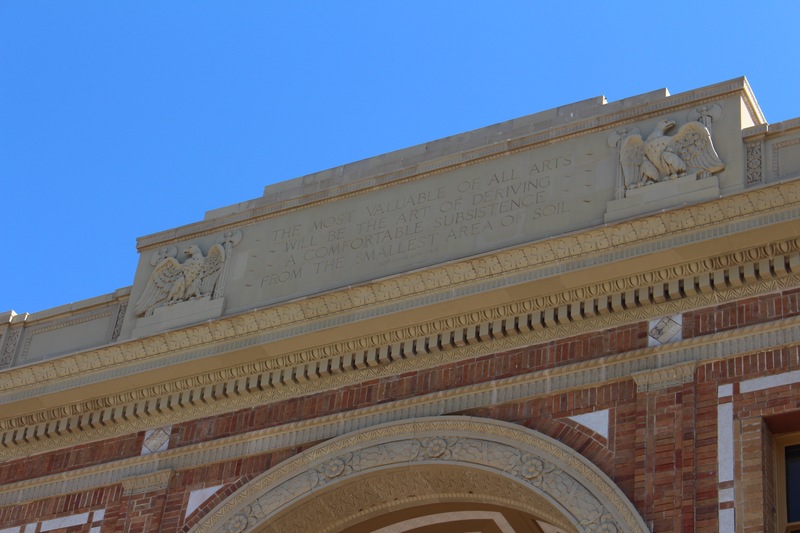 We noticed some signs about a historical building in Atascadero and discussed going back to check it out when we had some time. We had reserved a site at the KOA campground by phone, which they required for some of the sites in the campground for some reason, rather than letting you book online. From the highway, we followed the directions provided by the campground, since they wrote on their website that the GPS directions were not useful. We found the campground quite easily, just before you hit Santa Margarita Lake, which is also a popular camping spot. The campsites at the KOA in Santa Margarita are actually very different from anything we’ve seen anywhere else, since they are built into the hillside, almost on individual terraces up dirt roads. No pictures, because it was hard to capture. The tent sites proved to be a tad challenging to access in our low-slung Toyota Sienna with the even lower-slung trailer hitch, but we made it up and made camp, which generally has been: Angie pitching the tent with help from me when requested, while I put together the cots we have borrowed from her parents and maybe get the stove out and ready for cooking. I’m not sure we’ve talked about the cots. We have a queen-size air mattress with us, which we can inflate from the power outlet in the car, but we borrowed the cots because on cooler nights, of which we’ve had a few, it can actually get quite chilly because one is sleeping on air. We’ve found that sleeping on a cot with a Thermarest on top is cosier. In addition, that gives one a seat of sorts inside the tent, which is a bonus, since the bugs drive me into the tent pretty early most nights (see the blog on Ghivan’s Ferry, SC). Rebbe generally finds himself a spot behind Angie’s knees (on the cot) at some point during the night after we’ve put him in his bed at bed time. Once camp was established on our first night, I don’t think we did an awful lot. We made one of our tasty one-pot meals, which has often been more food than we want at one sitting, which has been fine with us. I think this was the evening we tried a recipe for curried salmon, which proved to be delicious. We plan to try it again with fresh salmon some time. We carry some Tupperware® containers, so the leftovers go in the cooler to be eaten a night or two later. This has enabled us to have a variety of dinners without cooking from scratch every night, or getting bored with our meals. We also met our campsite neighbor briefly, but talked with him quite a lot before we left. He was from Templeton, which is just down the road, and he said that many of the people who came to the KOA were pretty local, and that his wife had used the swimming pool at the campground when she was a child. Throughout the past year, Angie and I have been thinking about what we want to do when our gap year is up, which actually was the 6th of August (that was the date we flew to Europe to begin our adventure). We have concluded, after going back and forth a few times, that we want to look into the possibility of opening a bike-friendly hostel, possibly somewhere along the Pacific Coast Bicycling Route. By bike friendly, we mean, a place that offers the amenities that we either appreciated or missed during our travels with our bikes. Hence, the main objective of coming to California is to investigate that possibility and do the relevant research. One of our first steps in this process is to travel along that route and determine some of the locations that might appeal to us. Of course we know our dream location would be the Santa Barbara area, but even though everywhere in California is expensive, my old hometown of Santa Barbara is ridiculously expensive. We are not ruling anything out yet, after all, we could still win the Powerball (if we buy tickets), but we need to research locations along the coastal route. On August 8th we took one of our first steps by driving along part of this route, using the Adventure Cycling Association map as our guide. We’d purchased this map earlier (for one stretch of the route), knowing we wanted to check out the route. You probably don’t need the map in order to ride the route, but it helps (more if it’s updated), especially as it has some turn-by-turn information as well as some info (again, not always up-to-date) about places to stay and to shop and so on. 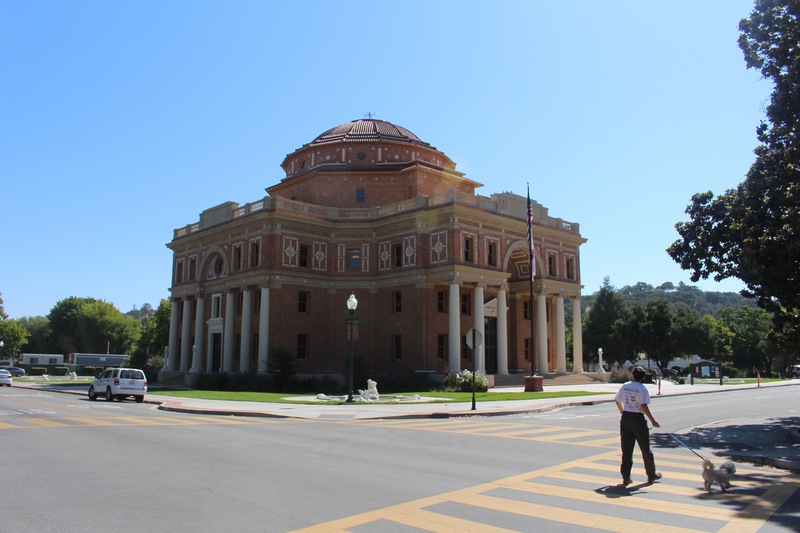 We actually started the day by driving to Atascadero to check out the city administration building, which is an historic site. Publisher Edward Gardner Lewis founded the Atascadero Colony in 1913 after moving from the Midwest with the dream of founding a Utopian community. There is only one surviving building from that time, the building known as the Rotunda, which was created as the headquarters of the colony at first. 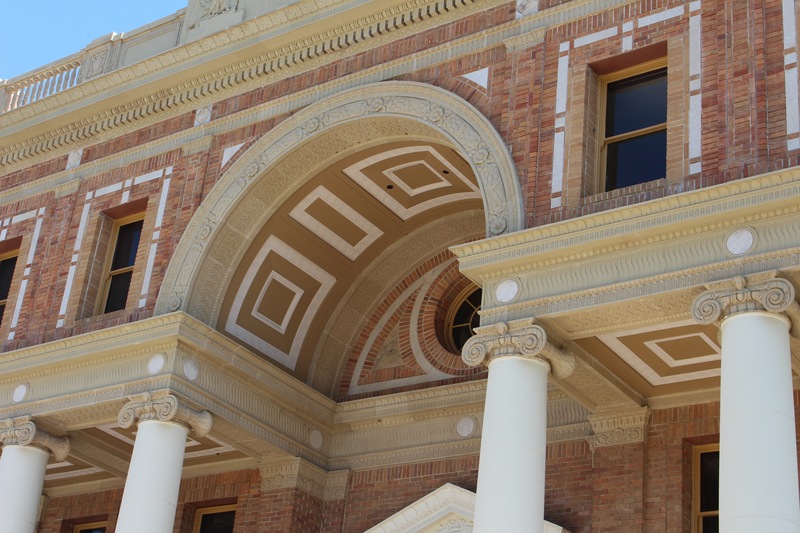 It’s a pretty spectacular building that has also served as a boy’s school, a veteran’s administration building, and offices for the county. It’s made of local brick, which is cool, and the building is now city hall. From there we headed out to begin to trace the bike route from Morro Bay, albeit in the car, because we don’t have the time to ride it. To be frank, after what we saw on the first day, we are not convinced we would want to ride some of it. A lot of the route runs along the fabled California Highway 1, which sounds delightful in principle, but has some fairly gnarly bits. There are some beautiful areas for sure, such as Estero Bluffs, where we all got out of the car but turned around when we realized Rebbe couldn’t come onto the beach with us. There are plenty of beautiful beaches that do allow dogs, but one has to do one’s research first. Of particular concern about the route was a hilly and narrow stretch that takes the riders into Lompoc. This raises the worry for us that we may not be able to enthusiastically advocate for this route if we don’t love it ourselves. But this was only the first day, so no final conclusions are being drawn. We drove most of the route from Morro Bay to the southern part of Santa Barbara, where the map we have ends. Some spots are quite unappealing to us because they would locate us in small towns that seemed quite isolated, and maybe not so friendly to a middle-aged lesbian couple. 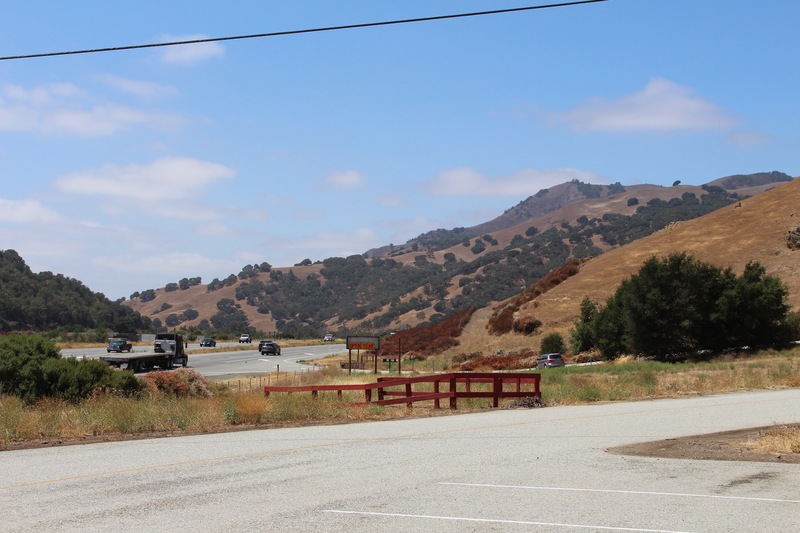 We also looked at some of the hostels and other overnight sites that might be our competition in certain areas, including the hostel in San Luis Obispo, which has a great location near the route and also close to the Amtrak station. Since this is a Hosteling International venue, it totally makes sense to be there. We didn’t go in, so we don’t know how bike friendly it is, but we did see bike parking outside. We did like the feel of San Luis Obispo, pausing for lunch in a park where young kids were playing T-ball, and checking out the Trader Joe’s and the area around it, which is smack bang on the bike route. The hostel in Santa Barbara, which has a mixed reputation on Trip Advisor, is currently closed for a remodel. We heard from the realtor with whom my sister in law hooked us up, that the owner (a new owner) is trying to remodel and revitalize it. We didn’t like that the road construction near there made it really hard to find our way out of the neighborhood! On Sunday we arrived at the home of Angie’s bestie, planning to stay a week, during which time we did more research. We met with the realtor mentioned above, who turned out to be someone with whom I played soccer back when I lived in Santa Barbara. She had some good insights and information for us. During the week we were there, I also checked out an orientation for a local group that supports woman business owners, and met with a potential mentor from SCORE. SCORE is an organization that provides mentors for people hoping to start a business. The mentors are primarily experienced or retired business people. The gentleman with whom I met was referred to me by the realtor after I told her I’d been looking into contacting them. Coincidentally, the person to whom she referred me has experience with bicycle touring himself, so he understood a bit of what we are trying to do, though he has mainly ridden fully supported tours, which offer many more luxuries than we are likely to be able to offer. We concluded that for now, we probably have to do something to bring some money in, while continuing to work on realizing our dream. We think this may have to be in the Bay Area, because that’s where the jobs are. More on this all as we go along. Did you get a look inside the Rotunda? I was wondering if the interior of the dome was as interesting as the underside of the exterior arch. Sadly, since it was Saturday, it was closed, but I hope we get back there to look some time.